It is the current day in New York, and there is no rest for the CSI and homicide teams, as murders continue to take place in their city. These people help prove the innocence or prove those who are guilty of such crimes. Through their eyes, you will get to see how they live their lives - professionally and personally. It is the current day in New York city, and no rest for the CSI teams, and for their colleagues, as murders continue to take place. These people help prove the innocence or prove those who are guilty of such crimes. CSIs from Las Vegas and Miami have travelled to work with the New York team to solve cases and live new lives. If you would like to apply for a character from any of the CSIverse, or an original character of your own, please follow the link below. Follow through to the rules, application, etc. Hi all--I work for a book publisher called BenBella Books, and I wanted to pop by and let you guys know about a book we've got coming out on CSI called Investigating CSI: An Unauthorized Look Inside the Crime Labs of Las Vegas, Miami, and New York. It’s edited by Donn Cortez, and is an anthology of essays that covers all three shows in an informative and insightful way. You can preview a few of the essays and order on our site: Investigating CSI on smartpopbooks.com . . .
hi guys, my name's Hailee. I'm a real big fan of both the original and Miami CSI.. I really like Greg Sanders alot but I love all the characters. I just got a new lj because i've been seriously neglecting my old one and i don't remember the password...I may have deleted it...anyway, I just wanted to say hi to everyone and that I write fanfics, so look forward to them in the near future. Beta: Thanks to helena_eternal for the betaing. Join CSI Live! RP now, great players still available! I'm a newbie to this community, but I figured this would be the place to be to look for help. I just opened a new forum, and I'm in desperate need of members, but more importantly, a fellow moderator. So we need about 2 major CSI fans to moderate that section of the board. 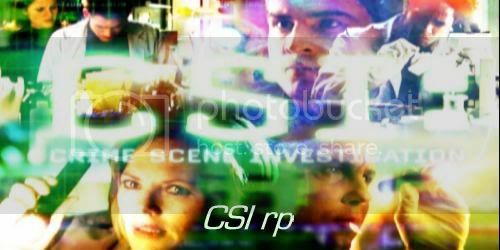 We also need graphic artists, fanfic writers, and anyone who has some serious (meaning LOTS OF) links to CSI related sites. Any help any of you can offer would be greatly appreciated. During Spike's CSI marathon on Monday, they're playing 3 eps from season 5. These are the first S5 eps to air on Spike, which means they'll probably start airing the rest this time around and we can see the whole thing again. The eps airing on Monday are Committed, Weeping Willows and Iced. Also, it looks like everyday next week, they're airing 4 CSI eps at 5, 6, 7, and 8pm. They all seem pretty out of order, except the 8pm one are the S5 eps airing in order. And on Friday, they're still airing eps at 9 and 10 along with everything else, both of which are from S5 (I'll finally see WEGG!). Pairing: It's all about the Grissom. References to GSR and pre-series GCR, though. Summary: Grissom likes Pink Floyd. Wonder why? A series of Grissom-centric vignettes through time. Warnings: Pretty much everything I could possibly warn you about except slash and character death. Notes: The structure will make much more sense if you've heard Pink Floyd's album, The Wall.